Measurement technology requirements? Order your standard pressure sensors easily and directly from us - with the WIKA quality you are accustomed to. A pressure sensor converts the physical quantity 'pressure' into an industry-standard signal. It offers a standardised interface and frequently is also referred to as a pressure transmitter or pressure transducer. You can have a WIKA pressure sensor in numerous variants: Around 176 measuring ranges are available from 25 mbar to 15,000 bar in the main international units, as gauge pressure, absolute pressure and vacuum, but also as compound ranges. We have over 14 output signals in our portfolio, including a number of current and voltage signals, and RS232 and bus signals. Different connectors and various cables can be selected from the 18 electrical connections. In a selection of 34 pressure connections, you'll be able to find internationally established thread types and also flush connections. Furthermore, an infinite number of options complete our broad spectrum. Among these, you will find various accuracies, pressure-spike damping, designs for special media and special ambient conditions, and much more. You can find the appropriate pressure sensor yourself from the categories below. We are happy to advise you in your selection and can examine individual solutions for you. The model A-10 is the most-used in industrial applications. The S-20 premium pressure sensor has been designed for critical, high-level and harsh operating conditions. In high quantities, the O-10 offers the optimal solution. With highly dynamic pressures to 15,000 bar, the model HP-2 is used, while the SL-1 pressure sensor is suitable for the smallest of measuring ranges to 0 ... 25 mbar. For the highest accuracy applications, the P-30 offers an accuracy of up to 0.05 % (full scale). Even for the harshest of conditions, WIKA can offer the appropriate electrical connection, such as the LF-1 submersible pressure transmitter for permanent immersion in liquids or the S-20 pressure sensor with field case. The S-11 pressure sensor with flush process connection has been developed specifically for the measurement of highly viscous and crystallising media. For applications in hazardous areas with ignition protection type “intrinsically safe” the IS-3 is recommended. The ignition protection type “explosion-protected” is met by the E-10. Our pressure sensors for refrigeration and air-conditioning systems have exceptional resistance to most refrigerants. For the highest requirements, the model R-1 is recommended. For its stainless steel design with a monolithic construction removes the need for using seals on the process side. Durable and robust are the hallmarks of pressure sensors for mobile hydraulics. Shock and vibration resistance, pressure-spike resistance (CDS system) and an ingress protection of up to IP 69K make the model MH-3 pressure transmitter especially qualified for the harsh operating conditions in mobile hydraulics. The model MG-1 pressure sensor has been developed specifically for the measurement of pressure with medical gases and for oxygen applications. In line with international directives, different levels of cleanliness, different packaging and different instrument markings are available. The high demands that are placed on the robustness of a pressure sensor, for example in filter monitoring in screw, piston and turbo compressors, are fulfilled without a problem by the model C-2. This pressure transmitter features a high vibration resistance and wetted parts that are suited to compressed air and lubricating oil. The pressure sensor design is faced with particular challenges in sanitary applications for food processing, beverage production, biotechnological processes as well as the pharmaceutical and cosmetic industry. The model SA-11 pressure transmitter and model PSA-31 pressure switch are particularly suitable for the special conditions of CIP/SIP cleaning processes, such as chemical stability towards cleaning liquids and high temperatures. 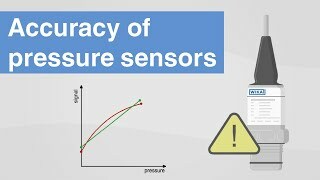 Accuracy of pressure sensors | Keep an eye on those 3 errors!